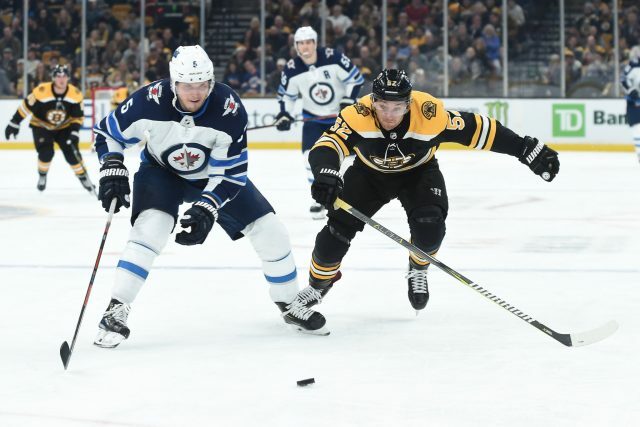 A nine-day break seemed to help the Boston Bruins at the start of their game against the Winnipeg Jets, but the problems from before their bye week and All-Star break remained. Winnipeg came into TD Garden on Tuesday night after falling in Philadelphia against the Flyers Monday. However, they prevailed and beat the Bruins in Boston. The Bruins won 15 of their last 16 home games against the Jets. But it seemed like old problems returned for Boston. Once again, they scored the opening goal of the night, outshot their opponent and still found the way lose. Sound familiar? The Bruins are now winless in their last five games when outshooting their opposition. Only two wins occurred for the Bruins over their last seven games and in both victories, the Bruins finished behind on the shot board. No one is trying to say that the Bruins should shoot less; they have been much better offensively than in previous games against the Rangers or Capitals. But on the other hand, it is still not good enough. The Bruins opened the scoring for the sixth straight game and just once they were able to extend that lead and that happened in Philadelphia exactly two weeks ago. Last night it proved to be fatal for the Bruins again. Winnipeg was outplayed heavily in the first period, Patrice Bergeron opened the scoring and had a point-blank chance afterward, but Connor Hellebuyck made a spectacular save. Shortly after, the Jets got on the power play and Josh Morrissey beat Jaroslav Halak from distance. Halak has not been good over the past couple of months and the goal seemed like a soft one. However, both of Kyle Connor’s goals were saveable in the third frame, manufactured off of a horrendous defensive display from the Bruins’ top line. But what that line gave, they took it back, with scoring all three of the Bruins goals last night. The game ended in a shootout and the Bruins lost. Playing and losing in a shootout is unpopular among the fans, but the Bruins played only one shootout before yesterday’s game this year and won it. Last year they even defeated the Jets at TD Garden in the shootout. The shootout was not the primary reason the Bruins lost. Disregarding the Bruins recent struggles and issues, they enter a season-defining sequence of games. Last season Boston concluded with 112 points and knocked out Toronto. If the Bruins want to at least repeat the same fate, they better start to win. On the other hand, is it really that necessary? Trent Frederic became the fifth player who made his NHL debut this season with Boston. Last season it also happened with five players. That’s 10 players making their NHL debuts over the past two seasons. It is not a miracle that the Bruins are in playoff contention, but it definitely should be a miracle that they are expected to be Cup contenders. Nobody expected them to be where they found themselves last season. And that was the key to their success. The success came out unexpectedly. Last night, again, they outshot their opponent 39-27 and yet lost. In order to change that, Boston has to get back to the basics, play simple and fun hockey again. This team has never played well under huge pressure from a lot of expectations and let’s be honest, no team really has this year.